Since winter is here in all its glory, enjoy some warm fun with friends and family at The Glass Garden! We have many classes of all ability levels, such as our Girlfriends' Night Out class, which needs no prior experience. The only requirement is a desire to have fun! The Beginning Stained Glass class teaches you everything you need to know. Also, we have a Beginning Glass Cutting class if you want to acquire glass-cutting experience without learning stained glass. This would enable you to participate in many of our fusing classes where basic cutting skills are required. For experienced stained glass hobbyists, this is a great time to work on a project for your yard or garden, such as stepping stones, garden stakes, etc. Spring will be here before you know it! Enjoy the New Year and the remainder of your winter months! Why do we say that?? MUD IN YOUR EYE. How did "here's mud in your eye" come to be an accepted toast? The expression is not a toast to another; it is a toast to yourself, for it means, "I hope I beat you". The allusion is to a horse race. If the track is at all muddy the rider of the losing horse is very likely to get mud in his eye from the horse that is winning. It's summertime, Yeah! You may be thinking of upgrading your yards, changing the look or maybe adding a little zing to some areas. We have the zing you may be looking for with custom stepping stones! You can come in and make one yourself, or we can make one for you with something that is personal to you or your family or with certain colors. We also have a variety of garden stakes in the store right now that will make your landscaping come alive with sparkle and color. I invite you to come in and explore the possibilities for your outside living areas! It's always exciting to enhance our lives and the beauty that we surround ourselves with. Also, be sure to complete this quarter’s WORD FIND and bring it into the store before September 1st for a chance to win a Glass Quarterly magazine and a $10 Gift Certificate to The Glass Garden! 1. Why Do we call small change "chicken feed"? 2.What is the origin of the term "icky"? 3.What is the origin of the term "kidnap"? 4.Why is a "jaywalker" known by that name? 5.Why do we say a person who has died has "kicked the bucket"? There as so many ways we can help customize your home. Do you have pendant lights in your kitchen that you would like to change? We can make fused glass globes on your existing fixtures! We also create glass inserts for kitchen or other built-in cabinets. Our shop offers a large selection of clear glass for you pick from. We do the rest! You may have a built-in with glass doors already, and we can help you change out the plain glass for designer clear glass or a glass that has some frosting to it. Another way to elevate your living space is with a custom design display piece. Out staff makes a variety of different shaped fused plates and hanging panels, and you can hand pick the color and design. The options are endless, and we are happy to help you elevate your home with special custom pieces, based on your design preferences and budget. We find ourselves at another edition of our fabulous, informative newsletter! 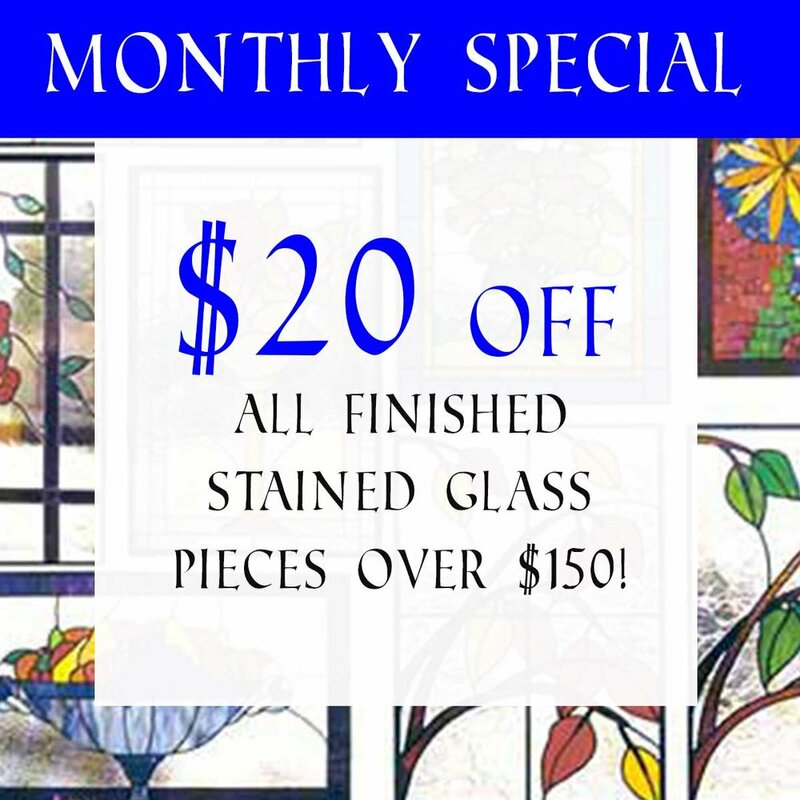 On April 8th and 9th, all sheet glass will be 20% off! Also our sale within a sale is on our amber scrap glass, buy 5 or more and get 30% off while supplies last. This is a great time to get your glass for a current project or future ones, so stop in and take a look! Also, be sure to complete this quarter’s WORD FIND and bring it into the store before April 30th, 2016, for a chance to win a Glass Quarterly magazine and a $10 Gift Certificate to The Glass Garden! Paper Towels--It was actually a factory production error in 1907 that resulted in America's packaged, tear-off towels. By that year, the Scott brothers' paper company was a huge success. Their high-quality soft bathroom tissue arrived from a large paper mill in a so-called parent roll, which were then cut down to convenient bathroom-size packages. One order from the mill proved to be defective. The parent roll was excessively heavy and wrinkled. Unfit for bathroom tissues, the product was scheduled to be returned when a member of the Scott family suggested perforating the thick paper into small towel-size sheets. The product, he suggested, could be advertised as disposable "paper towels". America's first commercially packaged paper towel was named Sani-Towel in 1907 and it sold primarily to hotels, restaurants, and railroad stations for use in public washrooms. There was a simple, economic resistance to paper towels on the part of home owners. Why pay for a towel that was used once and discarded, when a cloth towel could be washed and reused indefinitely? But as the price of paper towels gradually decreased, home owners found them more readily disposable and in 1931 the brand Sani-Towel and was renamed Scott Towels; a roll of two hundred sheets sold for a quarter. Whereas toilet tissuebecame a necessity of the bathroom, paper towels would become a great convenience in almost every room in the house. We offer a wide variety of classes for beginners and experienced glass hobbyists. For a complete list of the classes coming up, please CLICK HERE! Sign up with your email address to receive class alerts and news about upcoming sales! Welcome to another edition of our newsletter! We are in the throes of winter and so far it's been a mild one. There is one thing that has not been mild though, and that's Our Ladies Night Out! Our once a month event has been booked full since its inception over a year ago. Starting January 2016, we’re offering a new project for Ladies Night Out, a fused art strip, so grab your friend and sign up --EARLY-- this event fills up fast! This class requires no prior experience! The mission statement is: "Food-Friends-Fun". We just posted a TON of new classes, so be sure to check them out on our website, at www.eglassgarden.com/all-classes. Also, be sure to complete this quarter’s WORD FIND and bring it into the store before March 15th, 2016, for a chance to win a Glass Quarterly magazine and a $10 Gift Certificate to The Glass Garden! WHY CAN'T YOU BUY MACADAMIA NUTS IN THEIR SHELLS? Macadamia nuts do have shells. But selling them in their shells would present a serious marketing problem. Only Superman could eat them. According to the Mauna Loa Macadamia Nut Corporation, the largest producer of macadamias in the world, "It takes 300 pounds per square inch of pressure to break the shell"
After macadamias are harvested, the husks are removed, and then the nuts are dried and cured to reduce their moisture. The drying process helps separate the kernel from the shell; without this separation, it would be impossible to apply the pressure necessary to shatter the shell without pulverizing the contents. The nuts then pass through counter-rotating steel rollers spaced to break the shell without shattering the nutmeat. Of course, one question remains. Why did nature bother creating macadamias when humans and animals (even raging rhinos) can't break open the shells to eat them without the aid of heavy machinery? Gather your friends and/or family members and create a glass project! Our private parties are meant just for that. Invite 5 or more people to come and create a lasting project that everyone will be amazed at. Bring some food and drinks and make it more memorable. There are 5 projects to pick from and here they are: Stringer Plates, Name Plates, Art Strips, Confetti Trays, Snow Flakes. Call the Shop now and plan your private party class. NO experience is needed so don't leave anyone out. SNOWFLAKES DON'T LAST… OR DO THEY? Although real snowflakes that nature provides us don't last, ours do! You couldn't give a more perfect gift than a glass snowflake! Although we aren't nature we make some awesome snowflakes. There are several for sale or we can make one just for you. Remember a gift doesn't mean you have to give it away!!! Sign up to receive notifications by email of our newsletters and classes! Thank you for subscribing to our email list! We'll send you notifications of new "Blast with Glass" newsletters, as well as upcoming class alerts.